Councils in England want the power to issue on-the-spot fines to HGV drivers who ignore road signs and weight restrictions. 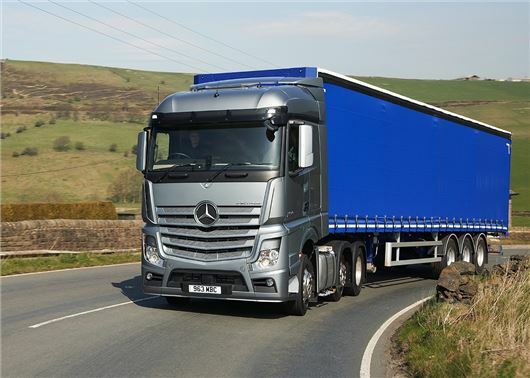 The Local Government Association (LGA), which represents 370 councils in England and Wales, says a lack of resources is hindering the police and its ability to prevent HGVs from flouting weight, height and width restrictions on local roads. The Government has already handed powers to local authorities in Wales to take action if lorry drivers break the law. The LGA says councils across the rest of the country must also be given the ability to enforce weight and width restrictions in their communities. The LGA is calling on the Government to give local authorities in England the power to issue fines to any heavy haulage lorry driver who ignore road restrictions. The money collected would be used towards tackling the nation’s £9.3 billion pothole backlog. “There has been a spate of accidents involving lorry drivers driving irresponsibly and bringing chaos to our communities,” said LGA spokesman, Martin Tett. HonestJohn.co.uk contacted the Road Haulage Association, but no one was available to comment. Without doubt some truck drivers do take shortcuts, sometimes contrary to posted prohibitions, but these are comparatively few. In order to prove the offence it is necessay to check whether the vehicle is en route to a destination within the prohibited area. In order to do that the vehicle either has to be followed all the way through, or stopped and the driver's load sheets checked. Have local councils the finances to provide personnel and vehicles to check the routes of heavy goods vehicles? Would such patrols have the powers to stop and examine the load sheets? This appears to be another example of the Police not having sufficient resources to provide traffic patrols, and local councils looking to boost their coffers by picking what they consider to be an easy target. The thin edge of the wedge. Give local authorities powers such as these will only lead to it becoming a cash raising exercise. And as far as funding pot hole repairs, how much will be left after employing "enforcers and their vehicles" or diverting funds to other "well deserved causes" not to mention council tax shortfalls. Local councils..not to be trusted. Whenever any authority tries to enforce the law some dubious caracter will pop up and complain it's a cash raising exercise. No it's not it's a cash removing ( from the agressor ) exercise. I daresay the majority of those who flout height,weight and width restrictions are those who come from the Eastern Bloc. Thanks to the Government who put in place the requirement for a rolling CPC ( Certificate of Competence ) leading to many older more experienced drivers putting in their licences. Cost of CPC around £300 every 5 years + 5 year health check to keep HGV licence £110 etc etc. Make a mistake on the road and VOSA over you like a rash and fines which can wipe out a months wages. Now these Local Authorities want to take the mantle over fines...great it'll lead to more drivers putting in their licences as well. If as a profession you stuck to the rules, drove with more consideration for all other road users, (4 mile overtakes on dual carriageways for example). You'd find the public more sympathetic. Yes I know car drivers can be thoughtless but you are the professionals, lead by example. but never sign diversionary routes, drivers rarely know if their delivery address in within the restricted area or not, I'm surprised any one wants to drive them these days and don't forget if you've got it a truck brought it.